Robin Bengtsson broke out as the dark horse of Melodifestivalen 2016 with his entry "Constellation Prize" and finished a respectable fifth overall. His participation in the contest helped to jump-start his career, as his earlier releases were not marketed to optimise their traction despite being quality content. He entered Melodifestivalen 2016 still having a day-job but his success allowed him to finally do music full-time. This time around he is entering with an uptempo soul-pop song more representative of his style, "I Can't Go On", which was co-written by the 2013 Melodifestivalen winner Robin Stjernberg. "I actually decided to go back when I heard the song I'm going to sing, which I love. It was originally written for me by Robin, K-One, and David. But then Robin thought maybe this is too high for him because he was singing in his key which is like four above mine. So when I got the demo I thought, 'I am not gonna sing this.' Then we changed the key and it felt great." 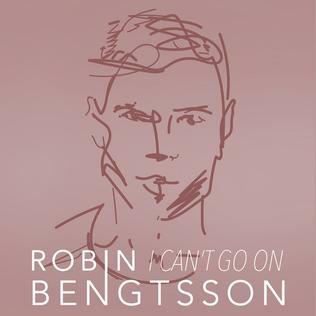 "I Can't Go On" has also been under scrutiny by the Swedish press for its use of F-bombs. Bengtsson finds the negative attention strange. "I don't think that it's such a big deal, actually. The funny thing is that Swedish artists who sing in Swedish, they curse all the time in Swedish and people don't mind. So I don't see what the big deal is, to be honest, when you do it in English." In contrast to his 2016 entry, Bengtsson has brought a considerably more elaborate, flashy, and impressive stage presentation for his song. There's back-up dancers, choreography that he participates in, with all of them doing it on treadmills that stop and start to match the song, and the entire number begins backstage and follows Robin and his dancers to the stage in time for the first chorus. "First of all, we had the idea of starting the whole thing backstage, which I got from a Jason Derulo music video with my manager and we thought that'd look cool, taking a different path to the stage. Then I think it was Zain, the choreographer, who [came] up with the idea with the treadmills. Then the real work started. 'We're gonna build this. How much are they gonna cost?' I think we were like, ten people involved in this, just making it happen. They're programmed to the music. We spent like a full day just programming and trying all the different kinds of moves on them. Then we had two more days to practice on them before they shipped them away here. So we haven't actually done that much rehearsing on them. A total of ten hours, maybe." Viewers that were only introduced to Bengtsson through last year's contest may be unaware of the true personality he holds unless they took the time out to research more of his back catalogue in which he displayed more of that attitude. "This feels more like the stuff that I did before. This feels actually more like me but I'm guessing for the audience and the viewers, it's gonna be a whole new me because the only me that they know is last year's Melodifestivalen. This is gonna be more fun. It's great to be able to do a performance like this because you don't always have a huge arena and big stage like this." Bengtsson has been working on writing new material for an upcoming EP he plans to release after the contest. When asked if he is trying to win the whole thing, he toes the line between being truly competitive and focusing on simply optimising his time on the big stage again. "I would love to win but it's not my main focus. My main focus is to get to the finals and get a radio hit and streams on Spotify. But I would love to win, it would be cool to go to Eurovision."